Traditional fashionable gold color maang tika embellished with colored stones. 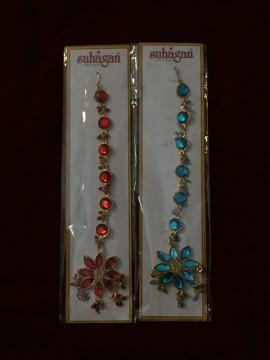 The tika has a floral shape pendant and the entire length is covered with color stones. There is a hook which can be attached into the hair. Can be worn by adults and kids. Great for bridal makeup or as a return gift / party favor. This item in Head Jewelry / Maang Tika category was first added to our catalog on 07-03-2010. Buy Traditional Floral Design Colorful Mang Tika, sold & shipped by desiVastra.com where you can shop online for Traditional Dress for Baby Boy & Girl, Indian ethnic Wear for Kids. This Mang Tikas collection has been tagged as maang tika, indian accessories online, return gift, party favors, girls accessories, bridal makeup.